If you’re in the public relations profession, it may not come as a surprise to hear that many PR professionals consider dropping their 9-to-5 office jobs to work as independent consultants. Those who do take the leap say that finding freelance work is relatively easy thanks to advancements in technology. 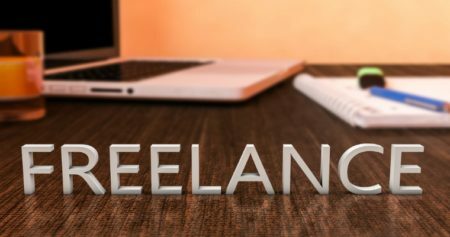 The benefits of turning to freelance work include setting your own hours, working from anywhere in the world that has a wifi connection, and attaining a level of creative freedom that so many PR professionals desire. However, with these benefits come a slew of challenges as well. From working longer hours to building a brand new client base, the transition to freelance public relations work can be trying both mentally and emotionally. If you’re thinking about making the leap into solo freelance work, consider following these tips to help ease your transition. When start marketing your services as a freelancer, make sure that you identify a niche strength and position yourself as an expert in it. This way, you make it know that you stand a level above your competition. While they might know a little bit about everything public relations, it will be more meaningful that you know a lot about one facet. Make this known through a clear mission, vision and focus for your brand and learn to walk away from prospects that aren’t a good fit for your identified expertise. You want to do your best work possible, and aligning yourself with projects that allow you to shine is the best way to ensure you are successful. One of the most important things you can do when you work from anywhere is to establish a dedicated a workspace. This is especially true if you work from your home or apartment, where you should set up a physical workspace that you don’t use for anything else. This transition from ‘home life’ to ‘work life’ will help keep your mindset professional. Be sure to also set a schedule of working hours that suit your workflow and life responsibilities and stick to it. Creating a structure for yourself allows you to complete your work while also understanding when you are logging off for the day. This is crucial for your work-life balance and can make or break your productivity and ultimately your success as a freelancer. From financial tracking to project management, freelancers have to handle all aspects of businesses on their own – and it’s not always easy (or cheap)! Luckily, there are plenty of affordable tools that can make everyday life easier. Save money on phone services by utilizing voice over IP connections rather than traditional phone lines. VoIP options come equipped with business features that are updated via software rather than hardware, so your capabilities can evolve as easily as they would with a bigger company. On the project management side of things, help make contract writing and invoicing easier with apps that offer fill-in-the-blank templates and e-signing capabilities. You can even utilize cheap or free financial tools to tackle budgeting, distributing invoices, receiving payments and dealing with taxes. No matter what aspect of business you have the most difficulty with, look for cheap tools to help make things easier. One of the most critical aspects of a successful business is gaining referrals, growing your network and developing deep relationships. One solid connection is far more effective than having a thousand unreliable ones. Keep in mind that all business relationships should be mutually beneficial, so when you approach people for something, remember to offer something as well. If you are starting out with limited established connections, directly market your services through email marketing, LinkedIn Premium for lead generation, and scour job boards and forums for warm leads that you can respond to. Improve your portfolio by writing about your craft to showcase how you think and problem solve. Content marketing can also be a great marketing tool by including an informational blog on your site for frequently-asked questions or by attaching your name to a contribution on a bigger, more reputable site. Your articles may show up in search results for potential clients if you utilize keywords and other SEO indicators, which allows clients to come to you! On top of writing your own content, ask customers and clients to write testimonials for you to include on your website. As you start your shift into a freelance role, keep these tips in mind to ensure your public relations efforts are as effective as possible. Careful research, a close appraisal of your strengths in the market and being as prepared as possible will ease the transition immensely. Katie Perkins is a digital content specialist who writes about business management and employee relations. In her spare time, she enjoys reading novels with a cup of coffee in hand. Use the Search box above to find other posts on this blog about freelancing.